On Friday, Oct. 9 (mom’s birthday!) I went to church. 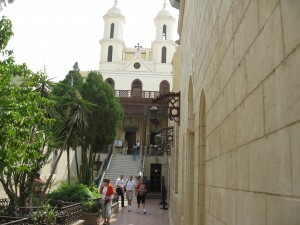 I took the subway to Mar Girgis train stop and went to Coptic church services at the Hanging Church. Hend at the Fulbright Office said that on Friday, services run from about 8am to noon. I went about 9am and stayed until 11am. It was mostly “Gregorian-style” chanting, except in the Coptic language. The service might seem chaotic from a Western point of view. People were coming and going; many people—both men and women—just walked up during the service and prayed over some of the church’s many relics from various Qadees or saints. Some kissed the glass boxes that the relics were placed in, others wrote short prayers and inserted them into the crack where the lid of the box was slightly open (filling the relic box with prayer requests). The priest stayed most of the service behind the screen on the right; however, a TV screen and projector suspended from the 11th century ceiling showed a side shot of what the priest was doing when reciting the liturgy or preparing the host for the Eucharist. As the priest recited the liturgy in Coptic (along with associate priests and what must have been “alter boys”—no girls), congregants joined in at times, crossed themselves as Catholics do, and seemingly haphazardly were standing, sitting, or bowing in prayer. At one point, the priest gave a short homily in Arabic, but then went back to liturgy. I left at one point, getting drowsy in the hot church with now nearly 100 people, and walked to St. Sergius church also in the Coptic area. This is the church with the crypt of the Holy Family. They were also doing liturgy. I walked back to the Hanging Church, and they were in the middle of passing out the sacrament—all the women were filing up to receive the host. The men and women do not sit together. Facing the front, men are on the left, women are on the right. All the women wore a scarf on their head—some with printed images of Pope Shenuda, or Jesus, or St. George slaying the dragon. By the time the Eucharist was done, I left the church, annoyed with all the tourists who were there (as the service was still going on) taking pictures and clogging the doorways. It felt like Christianity was 100s of years ago. The above mural is one I had not explained to me before the Walking Tour of Coptic Cairo with Fulbright a week ago. 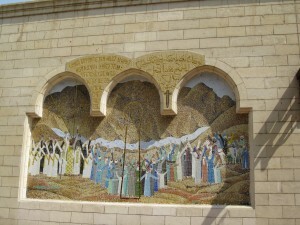 This mural depicts a miracle that the Coptic Pope helped bring about nearly 700 years ago when a Muslim cleric asked for a miracle when there were tensions between Muslims and Christians. The Copitic Pope had his congregation pray that the Moqaddam Hills would move. This mural depicts the earthquake the happened on the appointed day such that daylight appeared between the mountains.